With it looking like Spring is arriving here in Michigan, I have been in the mood for meals which are light, tasty and quick! So, I have been working on preparing meals which are healthy and home-made; not from a box or can and using fresh ingredients. 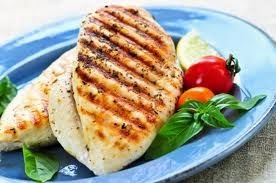 I found a recipe for broiled chicken breasts - if you would like to try it it is really easy . . . place them on the broiler pan, add garlic, pink Himalayan salt, pepper, thyme, marjoram and rosemary, then broil them. The end result will be a moist, tasty, flavorful chicken which you might served in pretzel buns or just on their own with a spring greens salad! Tasty and simple! If you have any leftover chicken, you could use some of the chicken in a chicken tater-tot casserole - I know, you are thinking, "Wait a minute! I thought you were using fresh foods!!!" I know most tater-tot recipes use caned cream of mushroom soup and processed cheese, but not me. I used frozen mixed veggies, cut pieces of the broiled, herbed chicken, tater tots and sharp shredded cheddar cheese and bake it for 25 minutes. The result is a tasty, lean veggie and chicken dinner and this is a meal which is so simple to prepare you could have your grandchildren help you assemble it and then serve it to their parents!